If you type the keyword social media aggregator into Google, you will be conveniently returned with a comprehensive list of ten social media aggregator tool options, and that’s just on page one. With social media becoming an incremental part of business marketing strategies, more and more tools flood the market everyday. Unfortunately, not all social media aggregator tools are created equal. So how do you choose the right social media aggregator tool for your brand? Well, we could just simply tell you that Juicer is your best option, but in the spirit of comparing “apples to apples”, we prefer to show you. 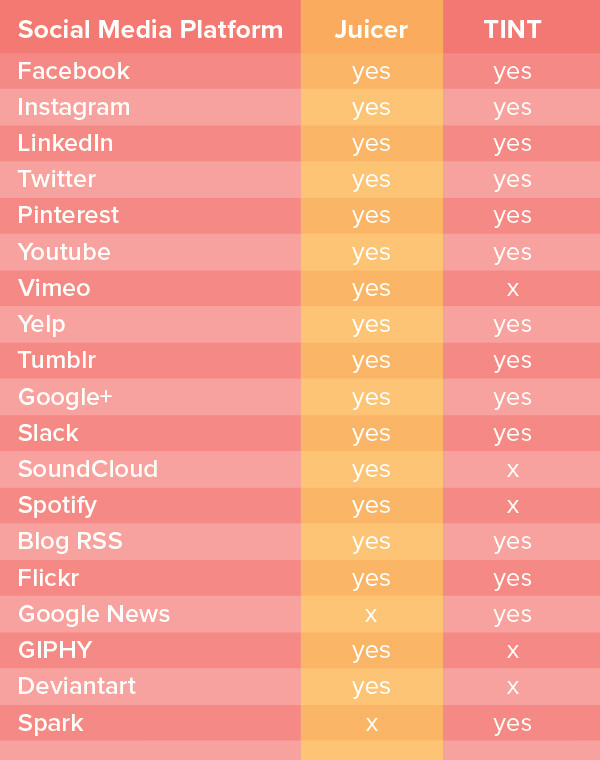 This side by side comparison chart will break down the difference between Juicer and TINT, arguably the two most popular social media aggregators in the market. What is a social media aggregator tool? Before we dive into the comparison, let’s quickly review what a social media aggregator is and does. A social media aggregator falls under the umbrella term social media marketing tools. 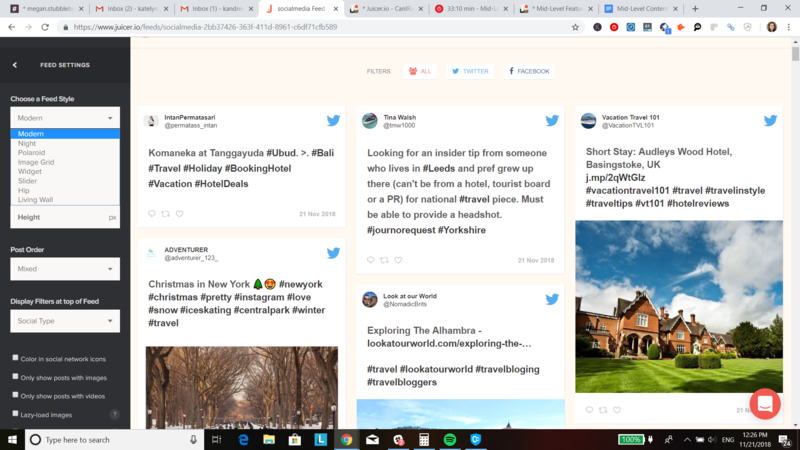 In a nutshell, a social media aggregator curates all of your social media posts, videos, images, and hashtags from various social platforms (Facebook, Instagram, Twitter) into one beautiful social media feed you can embed on your webpages. An aggregator acts as a social media management tool, and from a single dashboard, you can filter, organize, moderate, and schedule your posts without dealing with any coding whatsoever. Just take a look at Bon Jovi’s fantastic Juicer social media feed. All of his social network content is automatically curated and updated on his site giving his visitors a clean, professional looking glimpse into his social side. From marketing managers and small business owners to large advertising agencies, social media aggregators appeal to a wide variety of business and marketing professionals. A good social media aggregator should provide not only the most popular social media platform integrations, but a substantial variety as well. Juicer’s customers range from marketing agencies and mid sized companies to personal bloggers and struggling musicians. Our customers’ needs vary having different social platforms they want to connect their readers and fans to. TINT does also offer integrations with Widen, Hubspot, and Hootsuite for those who have subscriptions and the TINT enterprise packages. If you’ve stumbled across TINT’s pricing packages, then you’ve probably also tried searching for TINT alternatives. 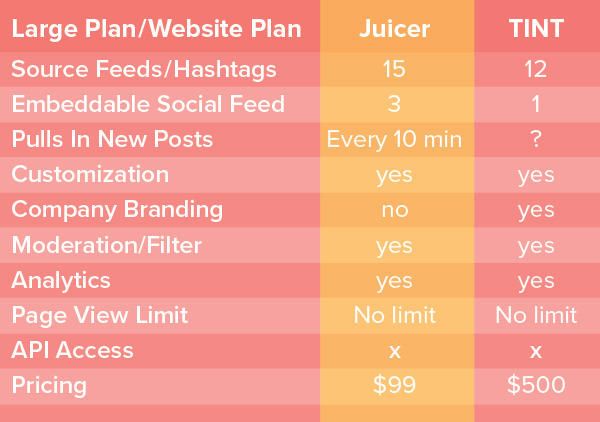 Unlike Juicer, TINT doesn’t offer a free option and their most basic package costs 5x more than Juicer’s Large package. Juicer offers a lifetime free social media aggregator plan you can quickly set up and embed on your website. Our free or Small plan allows you to add two social media sources and updates every 24 hours. 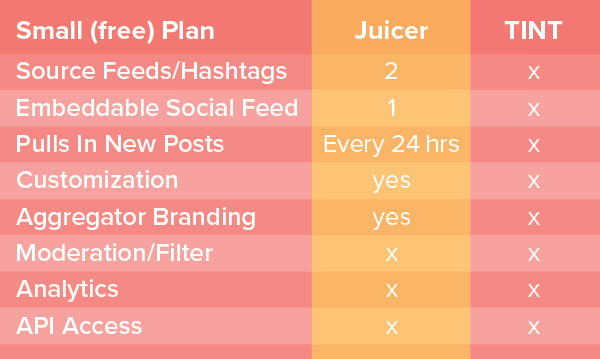 Juicer’s free social media management plan is perfect for smaller businesses or marketers who only have a few social channels. TINT has a good product with similar features to Juicer, but their cheapest plan starts at $500/month annually or $600/month without an annual contract. They only offer a 7 day free trial. Below is a complete breakdown of Juicer’s Small plan. Juicer’s Medium plan adds another 3 social sources allowing you 5 in total. With this plan you are also provided hourly updates, moderation and filter tools as well as no Juicer branding. Juicer’s Large plan is similar to TINT’s Website plan. The Large plan is designed for companies or larger agencies that have a wide variety of social media integrations and want frequent updates. This plan also offers analytic features. A comparison between the Large plan and Tintup’s pricing for their Website plan are featured below. If you want even more options, Juicer also offers an Enterprise package which allows you to create unlimited social media feeds. There is an initial setup cost and then you are billed monthly only based on the total number of social sources you use and how often the content is updated on your feeds. Enterprise is designed for organizations who require more feeds and sources than our normal plans allow, and for agencies or other groups whose needs for social feeds are constantly changing. The Enterprise package is also great for large events where you can display a live social wall that constantly updates your guests’ hashtags and tweets. With this package you are also provided full API access that allow you to completely customize Juicer. TINT also offers a custom package option that they can craft to your specific needs, however, their pricing information for this plan is not featured on their website. 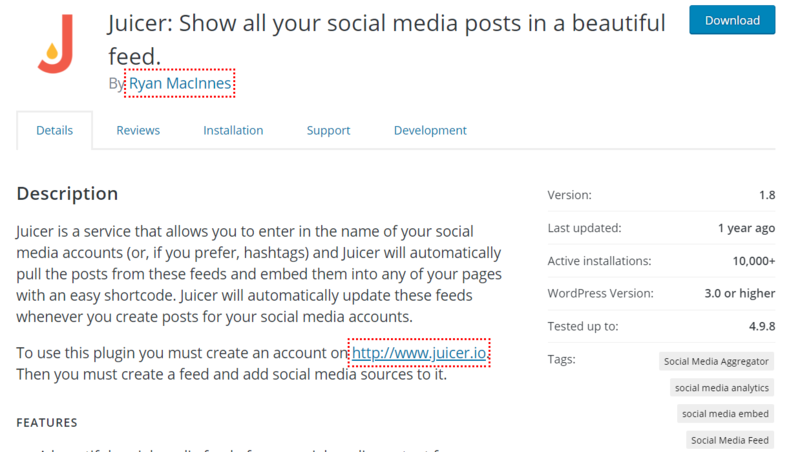 If your website operates on Wordpress, Juicer offers a free downloadable plugin. Juicer’s Wordpress Plugin is 5-star rated and has 10,000+ downloads. There is no Wordpress plugin currently available for TINT. At Juicer, we understand the importance of branding. Customizing the look and feel of your social media feed so that it blends in seamlessly with your website should be one of the most basic features of any social media aggregator tool. Juicer offers 7 different beautiful template options that you can fully preview, customize, and play around with in the dashboard. You can also add custom colors, change the interval speed, columns, width, height so integration with your web pages are unique to your site. The Small, free plan shows Juicer branding but any of the upgraded options eliminate that feature. TINT provides some impressive feed themes and customization options. Some features include a variety of unique templates, font and color customizations, language options, and popup customization. However at their Website option, TINT branding still shows up in the feed and their price tag for this plan is considerably high. 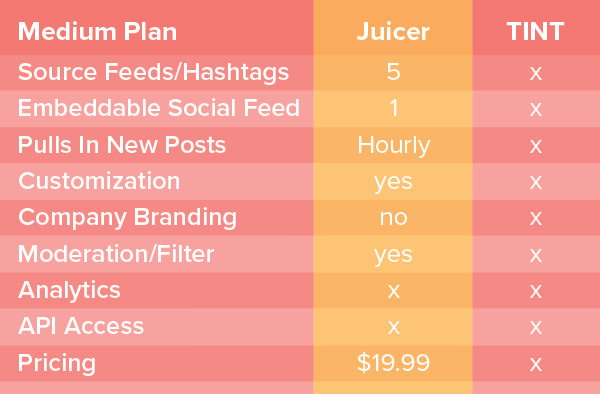 Juicer and TINT are clearly both great social media aggregators, it simply comes down to your social media needs and budget. If you're on a budget, but still want a beautiful, feature-packed social media aggregator tool that can be integrated and styled to fit seamlessly into your webpage or blog, Juicer is the best option. This is especially true if you need to support one of the less popular social networks. So What Are You Waiting For? Give Juicer a Try! Actions speak louder than words. Don’t just take our word for it, let Juicer show you! Sign up for a free Juicer account by simply entering your email and creating a password. Add your favorite social media feed source, such as Facebook, and watch as Juicer automatically curates all of your content into the dashboard. Feel free to play around with the moderation features and customization options. When you’re ready, embed your social media feed into your website then sit back, relax, and watch as Juicer brings your social side to life!